Thank you for your interest in Concrete Homes of Georgia. We are dedicated to provide the safest, most energy effecient, cutting edge housing available on the market today. Using icf (insulated concrete form) technology coupled with light guage steel framing technology allows us to build a far superior structure as compared to conventional framing. Not only are we ICF builders we are your steel framing experts. We offer a variety of services including but not limited to design and engineering, complete steel frame home kits as well as consultation services. As liscenced general contractors we offer commercial and residential services. Our structures boast high wind resistance, superior effeciency, fire resistance, termite resistance, and reduced insurance premiums. Insulated concrete forms are flat, hollow panels assembled to form the exterior walls of a home or other structure. They are made from polystyrene beads bonded together. In this process form manufacturers add a spacer between two panels to create a hollow cavity to be filled with concrete; creating the walls of a structure. There are several advantages in using ICFs to build your next home. ICF homes are quieter, more comfortable, extremely energy effecient. ICF homes are quieter due to the reduced noise and air infiltration due to the solid poured walls around the building envelope (the area of the home exposed to the outside). ICFs boast high insulation values as well as creating what is known as a thermal mass (any materials ability to store heat). In other words once the desired inside temperature is acheived the heating and cooling load is lesser than that of a conventionally framed home. Therefore the structure uses less energy to maintain temperature. In addition to reduced energy bills building with ICFs may qualify you for a federal tax credit. ICF homes are the safest structure for you and your family. Concrete has proven itself as the strongest longest lasting building material for thousands of years. It has far superior strength to any conventional building product. ICF structures have proven their durability, by withstanding hurricaines, blast testing, tornados, fires, and other destructive forces of nature. ICF homes coupled with light guage steel framing are termite resistant and will not rot. This means less maintenance and a reduced risk of structural issues. 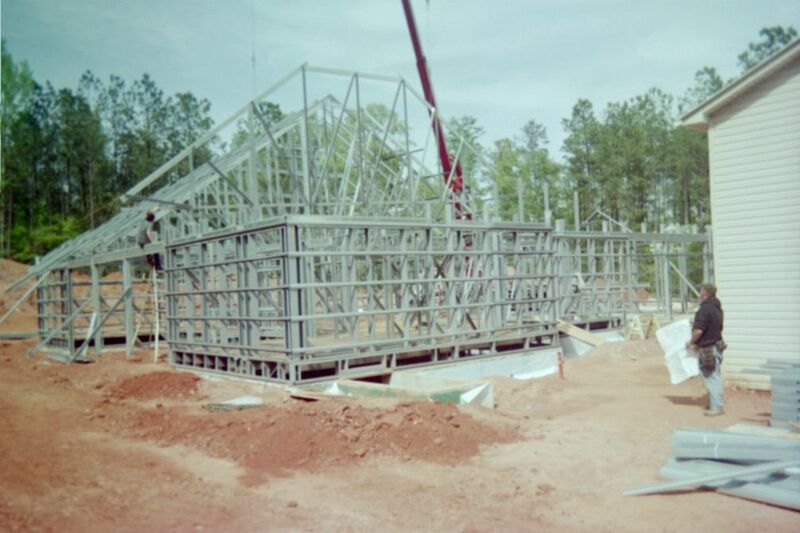 In addition to building ICF structures we are proud to offer complete steel frame homes. As an authorized dealer for Repco Industries steel frame packages, we are able to provide and erect the best steel framing on the market today. Included in these services: design and engineering, manufacturing of steel frame packages, and installations within the southeast.